Doyle enjoying his 1/4 of hare – don’t think it has ever taken the boys this long to eat dinner! Daisy, 3 year old and Poppy 8 year old huntaways. Our vet has finally conceded they are the picture of health and vitality without any veterinary formula processed biscuits, even our friends comment on it. After loosing our last dog to leukemia we were both determined to give these two a diet at least as much thought as our own (if you’re going to have them you have to love them!) and the raw food diet just makes simple natural sense. Ive been trailing the #7 meat blend and its a huge hit with both Teddy Bear (Mr Fussy) and Elmo Bear, I love the way I can take it out frozen when I wake up and within 3/4hour its thawed enough for them to gobble without having to thaw it overnight, and its heaps easier to store in my little freezer!! Well Done! The product looks so much fresher than the boxed product and no gagging smell like a % of the boxed can be sometimes – excluding the tripe. I’m definitely sold on the new product range! Great news! Daisy is now eating the real cat food I purchased from you. On Friday last week, I put the food beside her normal food. She ate the junk food, and then after a run ate the real food. And after a few days of that I just give her the real food and she tucks straight in! I just want to say how wonderful Bev, Mike & Emma are. We’ve been buying Auggie’s snacks & treats from Cats and Dog’s Dinner for 3 years now and wouldn’t go anywhere else. They’re very knowledgeable and I love the fact that their products are all made in NZ and natural without additives. 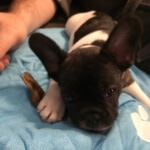 Auggie loves his Tweets , Lamb Trachea, Lamb Knuckle Chews & Roos Poos (Biscuits). Due to having liver issues & being blind, I can give him these treats knowing they’re natural & a healthier choice. It was great to sit down and chat with you about different options for Rory. Well after trying to bury his bone twice on the way home in the boot of the car, we have learnt that he LOVES the venison bone. He DEMOLISHED it once we got home on Saturday night (both knobs on the end were pulled off and chewed, and then the rest of the bone stripped back and thoroughly chewed), he then proceeded to bury it 3 times yesterday in our garden before bringing it in again this morning to have another gnaw on. He is also very excited at meal time, including licking everything around his bowl just encase anything was missed. 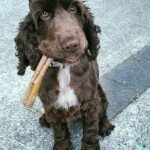 Thank you once again for all your help, and have attached a few photos of Rory having a good old chew on his favourite bone. The team at Dogs Dinner Company are fantastic! I always receive exceptional service no matter what my query, even if i’m ordering last minute they are very understanding and helpful. I have 3 cats, (2 adults and 1 kitten) who all really enjoy the raw food. So far their favourite is a chicken, liver, salmon and possum (i think) mix. They weren’t so keen on the tripe, but I think they’re just a bit fussy. The food is excellent quality, keeps my fur kids happy and has helped fix a few health problems too! I would definitely recommend The Dogs Dinner Company to anyone looking to get their pet the best food possible. 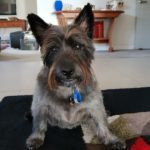 After lots failed experiments, including ‘premium’ processed dog food and ‘prescription’ diets, I stumbled upon the virtues of raw when I was researching my pup’s health issues. 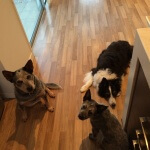 Calling Bev was a big step and the best phone call I have ever made for my pets. Instantly Archie went from reluctantly eating when he was absolutely starving to wolfing down his food and licking the bowl clean. It felt like I was feeding him proper dog food for the first time. His skin cleared up, his coat became shiny, his mood and energy levels lifted, his poos became solid and small – it was wonderful to see him so happy. When Cleo crashed into our life from a shelter she must have thought she’d landed in heaven! Not only did this house come complete with doggy company, human affection, lots of exercise, plenty play but it also fed raw meat, raw bones and tripe. People comment on their physiques, coats and teeth, and the fact that they don’t have a ‘doggy’ smell – it’s all down to raw. The three cats are also fully raw now and the purring chorus starts half an hour before feeding time. Happy animals, happy humans. Thank you Bev and Mike, don’t ever stop doing what you do please, as we could never go back to kibble. 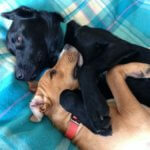 You’ve helped us to give our pets such healthy, happy lives.